Gesar of Ling (Tib. གླིང་གེ་སར་, Wyl. 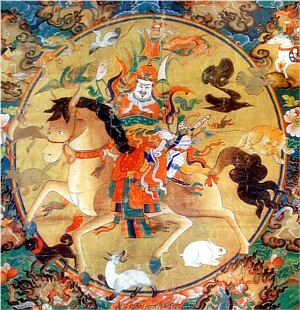 gling ge sar) — a legendary warrior king who is invoked as a protector of the teachings. Some people think of Ling Gesar as a famous warrior king or general, like Alexander the Great or the Chinese war gods. Others are of the opinion that Ling Gesar is primarily something like a tertön, an individual blessed by Guru Rinpoche who manifests to benefit beings through that blessing. But the real nature of the manifestation we know as Ling Gesar is actually that of Guru Rinpoche himself appearing in the form of a drala. Namkha Drimé Rinpoche, who is said to be an emanation of Gesar's elder brother, Jatsa Shakar, says that Gesar is the embodiment of the lords of the three families, appearing in the form of a drala. He is the body emanation of Manjushri, the speech emanation of Avalokiteshvara and the mind emanation of Vajrapani. This page was last edited on 9 March 2017, at 17:50.